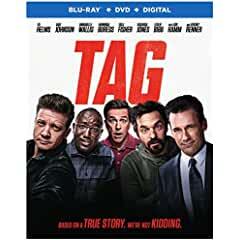 Join five highly competitive friends as they hit the ground running in the most epic game of the summer when “Tag” arrives on Blu-ray Combo Pack, DVD and Digital. From Warner Bros. Pictures, New Line Cinema and Broken Road production, this true story (We’re not kidding!) will now be yours to take home. “Tag” is directed by Jeff Tomsic (TV’s “Broad City”), with a starring ensemble cast led by Ed Helms (The “Hangover” movies, “We’re the Millers”), Jake Johnson (TV’s “New Girl”), Annabelle Wallis (“The Mummy”), Hannibal Buress (“Neighbors”), Isla Fisher (“Now You See Me,” “Wedding Crashers”), Rashida Jones (TV’s “Parks and Recreation”), Leslie Bibb (“Iron Man 2”), Jon Hamm (“Baby Driver,” TV’s “Mad Men”) and Oscar nominee Jeremy Renner (“The Hurt Locker,” “The Town,” “The Avengers” films).